This entry was posted in Stephen Sweeney and tagged Billy the Kid, Bob Dylan, Chicago Defender, Door, Heaven, Knockin' On Heaven's Door, Pat Garrett by Stephen Sweeney. Bookmark the permalink. 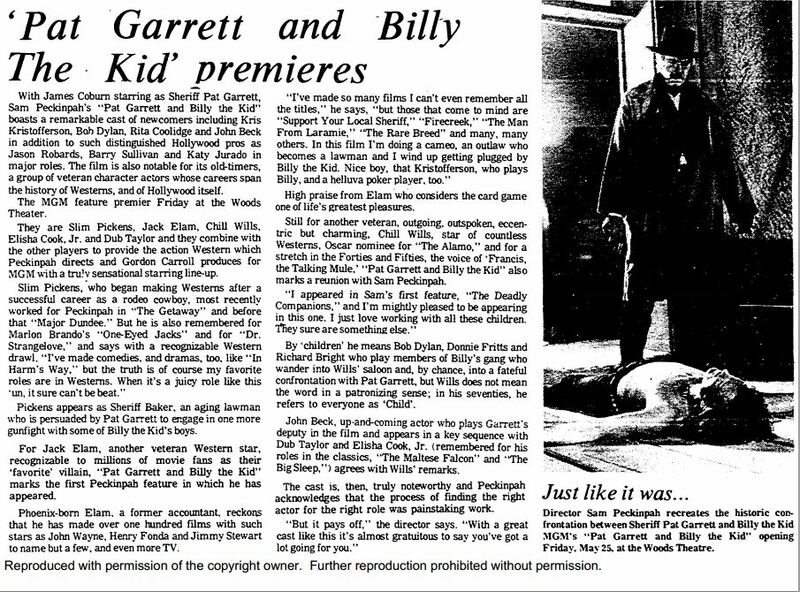 PS – There are promotional materials from Pat Garrett and Billy the Kid in the “Popular Culture in Britain and America, 1950-1975” database – just search “Bob Dylan,” and it’s the fifth result. Might be neat to include a screenshot in your post. You’re right to ask, “Why would Bob Dylan do this?” But I’d caution you not to take the “selling out” narrative too far. On the one hand, yes, he entered the folk music scene in part because it was a niche he thought he could exploit, but that doesn’t mean he didn’t sympathize with the folk revival movement in certain ways. Similarly, when he plugged in and seemingly turned his back on that movement, he was arguably just moving on to more “authentic” turf, since many black blues musicians had been plugged in for decades. I see his filmic turn in a similar light: though inherently commercial, the West was considered a source of authentic American culture. Bob Dylan might have seen the film as an opportunity to reinforce his authenticity in a new way – which isn’t the same thing as selling out. After all, all musicians make compromises and seek out professional opportunities to further their career; Bob Dylan may have just been better at this than many others.